Today we observe the anniversary of the 9/11 terrorist attacks on the World Trade Center. Sixteen years on, we can be proud of the rebuilding effort taking place. New York is a resilient city and the National September 11 Memorial and Museum will ensure that the events of that horrific day are remembered for generations to come. The Museum also commemorates the 1993 World Trade Center bombing which killed six people and injured over a thousand. For the most part, New York has been lucky, with only one well reported event last year, a bomb exploding in a dumpster on 23rd Street slightly injuring 29 people. Unknown to most, this was only one of hundreds, yes… hundreds of terrorist attacks that have occurred in New York in the past century. The movements that inspired these terrorist acts have been relegated to the ash dump of history and New York has persevered as a bastion of freedom and prosperity. Here is a brief history of some of the more notable terrorist events of the past hundred years. The early 1900’s were a fervent period of unrest with anarchists, left wing radicals, and Marxist operatives carrying out multiple bombings throughout the country. July 4th, 1914 on Lexington Ave. and 103rd Street. Three bomb makers were killed when an explosion went off prematurely in the apartment where they were assembling the device. Their likely target was John D. Rockefeller Jr., Director of US Steel, and son of John Rockefeller, the founder of Standard Oil. The dead were identified as members of the Industrial Workers of the World. The intended bomb plot was probably retaliation for the Ludlow Massacre, the killing of nineteen striking coal miners by the Colorado National Guard at a mine partially owned by Rockefeller. In April of 1919, mail bombs were sent to prominent politicians and government officials throughout the country. On June 2nd of that year, coordinated bombings occurred in eight major U.S. cities. Bomb laden packages were sent to officials and judges responsible for the anti-sedition laws and for sentencing anarchists to prison. In New York two anarchists were killed when they planted a bomb at the doorstep of a prominent judge on East 61st Street. The front of the home was demolished and windows were shattered for blocks around. 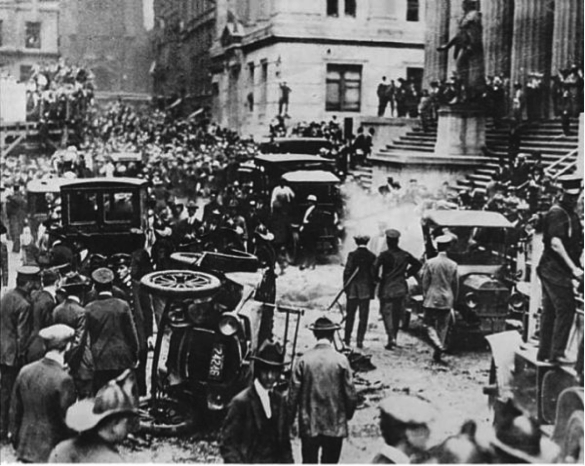 September 16, 1920 was a typical day on Wall Street. The bell tower at Trinity Church just chimed for the 12th time signaling high noon. The streets were teaming with stockbrokers, clerks, and office workers heading out for lunch. Nobody noticed the horse drawn cart parked in front of the J.P. Morgan headquarters at 23 Wall Street. The cart, which was packed with explosives and window sash weights, exploded in a massive fireball that tore through the financial district. Thirty-eight people were killed and over 150 severely injured. It was the largest terrorist attack in the United States until the Oklahoma City Bombing in 1995. At first it was thought to be an accident. Transportation of explosives to construction sites was commonplace. However, it was soon suspected to be the work of terrorists. The Bureau of Investigation, forerunner to the FBI, investigated for years but no one was ever convicted of the heinous crime, although Italian anarchist followers of Luigi Galleani were thought to be responsible. After the FBI reopened the case in 1944, a Galleanist named Mario Buda was identified as the most likely culprit. Buda fled to Italy soon after the explosion and was never brought up on charges. To this day shrapnel damage is still visible in the limestone façade of 23 Wall Street. In the 1940’s and 1950’s New York was terrorized by a series of bombings and attempted bombings that confounded police officials for the better part of sixteen years. Thirty three pipe bombs were hidden at locations throughout the city such as Radio City Music Hall, Grand Central Station, the NY Public Library, and Port Authority Bus Terminal. Twenty two bombs detonated. While no one was killed, fifteen people were injured. The bomber left notes for the police and to newspapers complaining about Con Edison. The perpetrator was dubbed “the Mad Bomber” and was thought to be a disgruntled ex Con Edison employee. Hundreds of former Con Ed employees were tracked, but the investigation was hampered by false leads, crank letters, and copycats. By 1956 the NYPD embarked on the greatest manhunt in the history of the police department. They employed one of the first uses of psychological profiling in a criminal investigation. The profiler accuratly predicted the suspect’s appearance, personality, motivations, and even the clothes he would be wearing at the time of his arrest. The police followed up on a lead provided by a Con Ed clerk after checking company records and arrested George Matesky in his Waterbury, Connecticut home. It turns out he had a grievance against Con Ed for an accident that occurred in the 1930’s for which he felt he was not adequately compensated. Matesky was convicted of a battery of charges, but was found to be a paranoid schizophrenic and was committed. He was released in 1973. George Matesky: the Con Ed employee who became the Mad Bomber and eluded the NYPD for sixteen years. The 1939-40 World’s Fair at Flushing Meadows was the second most expansive World’s Fair held in America after the 1904 St. Louis Exposition. Forty four million people attended the fair and sixty countries from across the globe set up exhibitions and pavilions. The theme was the future and the world of tomorrow, but no one could predict that the fair would be the site of a terrorist bombing that took the lives of two NYPD bomb squad detectives. The bomb was planted in a mechanical room of the British Pavilion. The squad removed the bomb outside and was attempting to diffuse it when it exploded. It was July 4th, 1940, a date who’s significance was not lost on those investigating the crime. 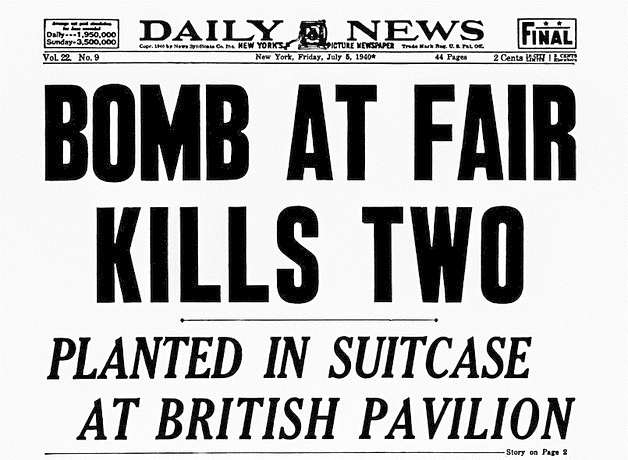 Two weeks earlier two bombs exploded in the German Consulate Building at Battery Park and by 1940, England was already at war with Germany. Investigators thought the device was planted by operatives of the American Bund or Nazi Party who were very active in New York at the time or the Irish Republican Army. However, others believe that British intelligence planted the bomb to garner sympathy and help bring the Americans into the war against the Germans. After an exhaustive investigation by the NYPD and FBI, no arrests were ever made. The case remains open. Greenwich Village between 5th & 6th Avenue, an enclave of tidy Federal and Greek Revival style town houses, would not seem to be a likely hotbed of terrorist activity, but for one day in 1970 it was just that. The neighborhood, also known as the Central Village, was close to the epicenter of the counter cultural revolution taking place in the West Village. 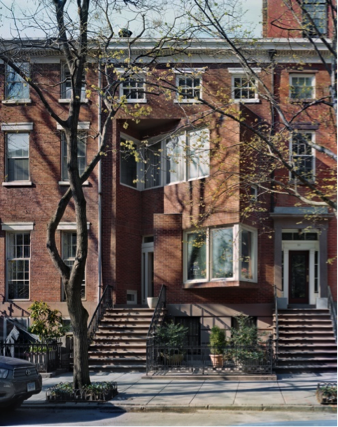 The townhouse at 18 West 11th Street was owned by the father of a member of a leftist terror organization called the Weathermen, an offshoot of the Weather Underground, a militant faction of the Students for Democratic Society who bombed the Pentagon and the US Capital. 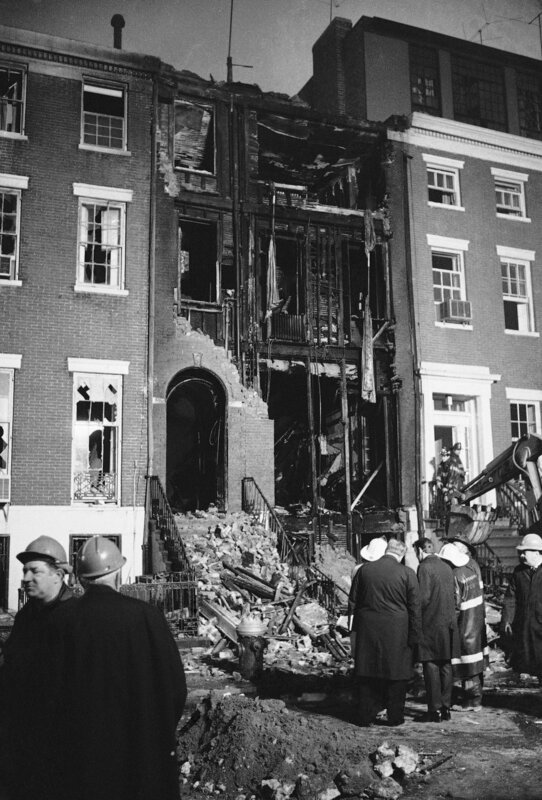 On March 6th, 1970, a group was assembling a nail bomb in the basement when it detonated prematurely destroying the building and killing three of the organization members. Two others on the 2nd floor were stunned and bloody but survived the blast and managed to escape. The blast was initially thought to be natural gas explosion, but upon further examination, munitions and bomb making equipment were found. The home was originally owned Charles Merrill, the founder of Merrill Lynch, and was rebuilt in 1978 by Hugh Hardy. 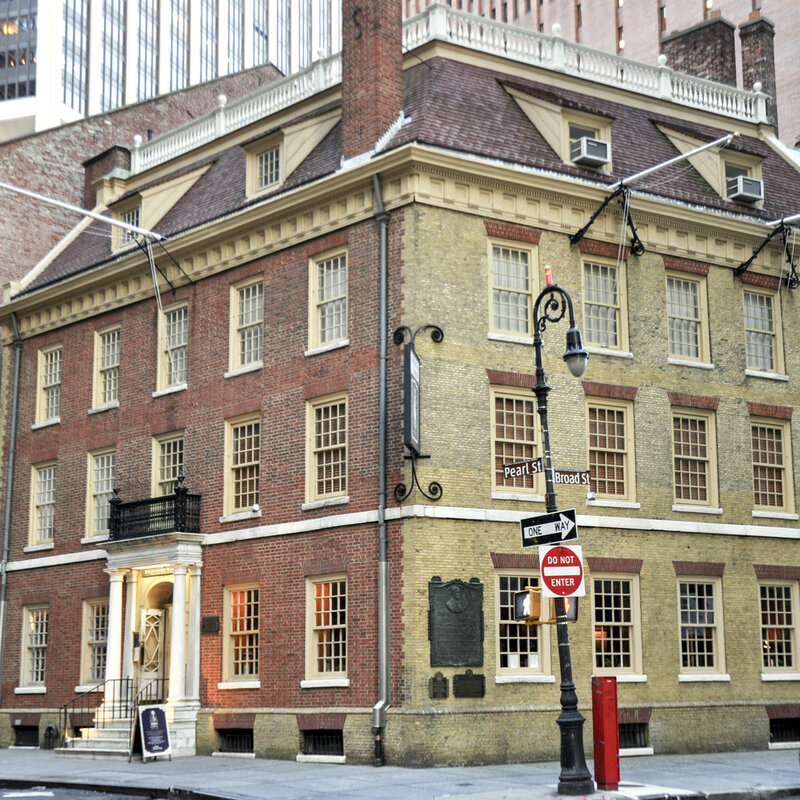 Fraunce’s Tavern at 54 Pearl Street in lower Manhattan is listed on the National Register of Historic Places. As the location of pre-revolutionary meetings of the Sons of Liberty and the place where General Washington bid his farewell to arms, it holds a vaunted place in the history of the US. It is also a popular tourist destination, restaurant, and gathering spot. It was probably for those reasons that FALN, a Puerto Rican Marxist terror group, chose it for a bomb attack on January 24th, 1975, killing four people and injuring several dozen more. FALN was responsible for over a hundred bombings in the 70’s and 80’s in their quest for Puerto Rican independence from the US. The bombing was recently in the news as the former leader, Oscar Lopez River, who spent 35 years in prison on terror related charges, was invited by parade organizers to lead the last annual Puerto Rican Day Parade. After several corporate sponsors backed out and political pressure mounted, the parade organizers rescinded their invitation. So, it seems that the ‘good ol' days’ weren’t always so good. New York has been a hotbed of terrorist activities for over 100 years. The nature of threats to the city is ever changing, but New York is nothing if not resilient and has recovered from every attack that has been perpetrated upon us. Our law enforcement infrastructure is better than it has ever been and are probably safer today than we were for the better part of the 20th century. Thankfully, we have had a relatively low occurrence of terrorist incidents since 9/11. As we commemorate 9/11, let us not forget New York's turbulent history and be cognizant of our our city's vulnerabilities, as well as its visibility on the world stage as a representation of freedom and prosperity.